Topics: Indoor Arena, Arena Usage Schedule, and Horses For Saleand/or Lease. 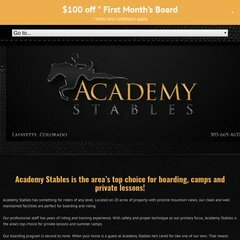 Academystables.com's IP address is 184.168.238.1. Godaddy.com Inc (Arizona, Scottsdale) is the location of the Apache server. It has 5 nameservers, including dns5.name-services.com, dns1.name-services.com, and dns2.name-services.com. PING www. (184.168.238.1) 56(84) bytes of data.